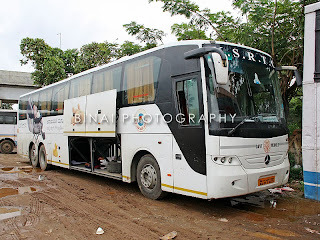 KSRTC Merc Benz: Thrissur to Bangalore yet again! I was thinking of going home after a very very long time. The dates I was planning was still a month away - without another thought, I went ahead and checked on the Karnataka SRTC website. The Thrissur-Bangalore B9R was almost sold out already, while the Ernakulam-Bangalore Merc Tri-axle had a lot of seats - I decided to book on this one, and selected a seat around the middle of the bus. Days went past. As the traveling day came closer, I was unsure if I'd be able to travel. It so turned out that the weekend would be working, and I'd have to take a leave to go home. I almost dropped the plan to go home, but did not cancel the ticket. Finally, on Friday afternoon, I decided to head home (read here).